We all love to hang plants in hanging planter in the balcony and other places in our home. They usually look great when we maintain them every day. Office dwellers and people who are busy get little or no time to properly maintain the plants which actually leads the plant to thrive in sun and part of its shades. Many would want to know how they can maintain the plants with the least efforts. Some tips would really help them to care for their loved plants hanging in their balcony. So let us see what care we can take to keep our plants healthy and blooming always. Weight is a big technical factor which should be kept in mind before hanging any planter in your drawing room. Structure adds beauty but before that one should check whether the planter is capable of raising the weight of the plant and the weight soils. When the plant grows it gains weight from its branches, roots, and soil always being a constant weight for the hanging planter. So never fail to check the hanging source like the ceiling and the plastered wall whether it is capable of hanging weight of the planter or not. Also, check the rope which hangs the planter in place. Adding perlite in the soil also helps the weight of the soil to reduce along with maintaining the drainage of water from the soil which helps to maintain a constant weight of the hanging planter. Which type suits our planter? Often people buy plants which need great care and maintenance but fail to maintain them daily. So buy plants which need less care and also provide the beautiful look to your drawing room. If you are living in a humid zone the geraniums and calibrachoas are the suitable choices for you. If you have a balcony or drawing room in a shady area then plants like fuchsias and begonias are perfect for you. So choose your plant type according to your room setup and accommodation. 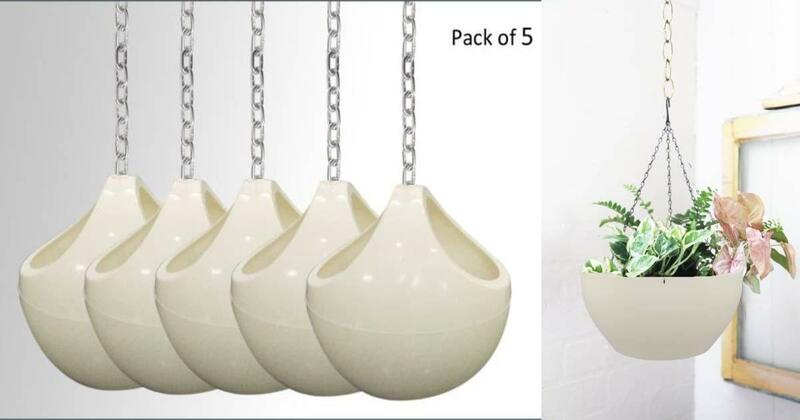 Perfect type of plants in hanging planter can meet the beauty of your room along with easier maintenance. When we buy plants, we should keep in mind that we buy the right pot or basket for our plants. Different plants need different soil treatment to grow up. And of course, watering the plants in proper time also stands out to be a prime factor for the maintenance of the hanging planter. Technically small baskets holding plants need water frequently so that it does not dry up quickly and similarly large baskets which hold more soil needs one time watering until it gets dry up. Due to the larger amount of soil quantity and treatment, water takes a longer time to get dry up thus frequent watering of the plant is not needed. Last but not the least groom your plants like a baby. It is preferably to pluck of the fully grown flower, old leaves turning yellow and unwanted branches to offers fresh growth of the plant. Trimming the unwanted and bushy branches helps to maintain the light weight of the hanging planter.